Three voyages in one. 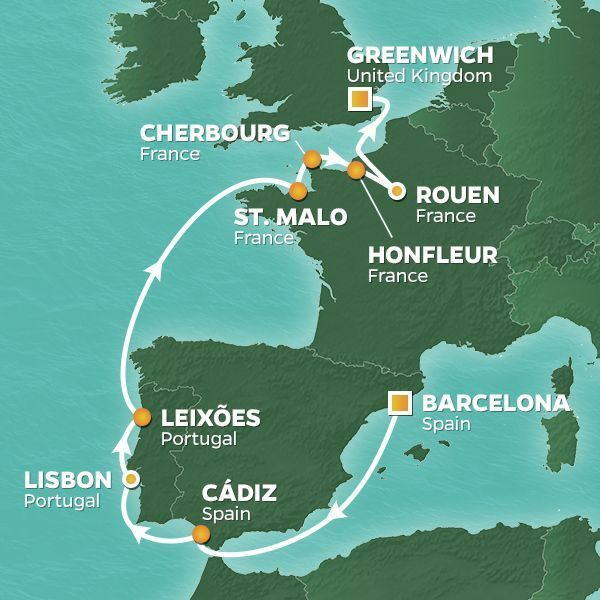 Sail from the land of wine and tapas to the site of the Normandy landings, then onward for a front row seat to the "L'Armada de la liberté." It's an experience you'll never forget. Begin in Cadiz, one of the world's oldest cities with 160 watchtowers overlooking the sea. Enjoy the old town, local beaches, or the mountains, where you'll find restaurants specializing in local game. Or, tour the Alcázar of Segovia and sample Seville's excellent wine and tapas. An overnight stay lets you tour Lisbon's old quarters, enjoy a steaming bowl of caldo verde, and take in a fado performance. The next day, visit the World Heritage site of Sintra and beautiful Pena Palace. Enjoy the excellent wines of Portugal, and visit the famous port houses of Porto for a truly superb tasting experience. Crisscrossed by handsome bridges, this river region is beautiful and well worth exploring. A restful day at sea brings us to the beautiful walled city of St. Malo. There's a lot to explore here, including a fort used as a German bunker in World War II. Of course the jewel of this area is Mont-Saint-Michel, a legendary Benedictine Abbey. Cherbourg and Honfleur are small French towns that played roles in the D-Day landings. We'll honor the 75th anniversary on June 6 with optional tours to Omaha Beach, the Normandy American Cemetery and Memorial, Pointe du Hoc, Juno and Gold beaches, and Sainte-Mère-Église. A visit to Monet's gardens of Giverny or Deauville are other options. Every five years, the finest and largest sailing ships from all over the world arrive in Rouen after winding their way up the River Seine through Normandy for a week of concerts, parties, and fireworks. You'll appreciate our parking spot at the heart of action. Top it all off with a fantastic overnight stay in London at the end. A luxurious boutique hotel at sea, the Azamara Journey® is a mid-sized ship with a deck plan that's intimate but never crowded, and offers everything modern voyagers are looking for—plus some unexpected extras. “Stay longer. Experience more." It's the philosophy behind every Azamara Club CruisesÒ voyage. It's what brings you to iconic destinations like Monte Carlo, and offers the opportunity to attend the world famous Monaco Grand Prix. It's what led to complimentary AzAmazing EveningsÒ, where you can listen to the sounds of a private performance by a 12-piece string orchestra, in the cozy atmosphere of the Odeon, a classic Roman theater. And it's what enables you to go behind-the-scenes of local life, with more time and opportunities to experience local culture in authentic ways thanks to Destination ImmersionÒ. Go farther, travel deeper, and bring your boutique hotel at sea with you every step of the way. Some things in life shouldn't be rushed, and we believe travel is certainly one of them. Every Azamara voyage features longer and overnight stays in port, so you can experience your destinations at all hours of the day. More time on land offers the opportunity to take a train ride through the deep green mountains of New Zealand, capped off with a traditional meal cooked over a pit oven of hot rocks. With overnight stays, you can spend an evening and following morning at a quaint Bed & Breakfast in the hills of Tuscany. And nights docked in port let you attend a show or two on the other side of the world. Where in the world would you like to go? From the tropical West Indies to the stunning Mediterranean to the Land Down Under, if there is a destination you've always wanted to experience, there is a good chance you can get there on one of the various Azamara itineraries, taking you to both famous destinations and hidden gem locales. Azamara itineraries seldom repeat ports, so you can make the most of your time spent traveling the world while getting an immersive look into a variety of destinations, all on one voyage. Sit back and relax. Or get out and explore. We'll be here a while. When you do choose to come back onboard, you'll be completely taken care of with inclusive amenities, a relaxed atmosphere, and a passionate and friendly staff and crew that will go out of their way to make your voyage one you won't soon forget. Welcome to your home sweet ship.